The burnished red surfaces decorated with scrolls in white slip, the raised head bosses and other details partially decorated in silver, now tarnished. Búcaros de Indias were exported to Europe where they were much prized for their scent and medicinal qualities. They were used to store water which released the characteristic aroma of the clay. The indentations increased the surface area and aided evaporation. In Spain they served to humidify the hot and dry Spanish air. It was also believed to be beneficial to health and Spanish woman went as far as to eat fragments of this ware to aid digestion. Related examples of the form of the base and cover of these vases and examples of the raised head bosses are found on examples in the Museo de América, Madrid (Collection formed by the wife of Iñigo Vélez de Guevara, Count of Oñata and Villamediana and Viceroy to Naples 1648-1653). 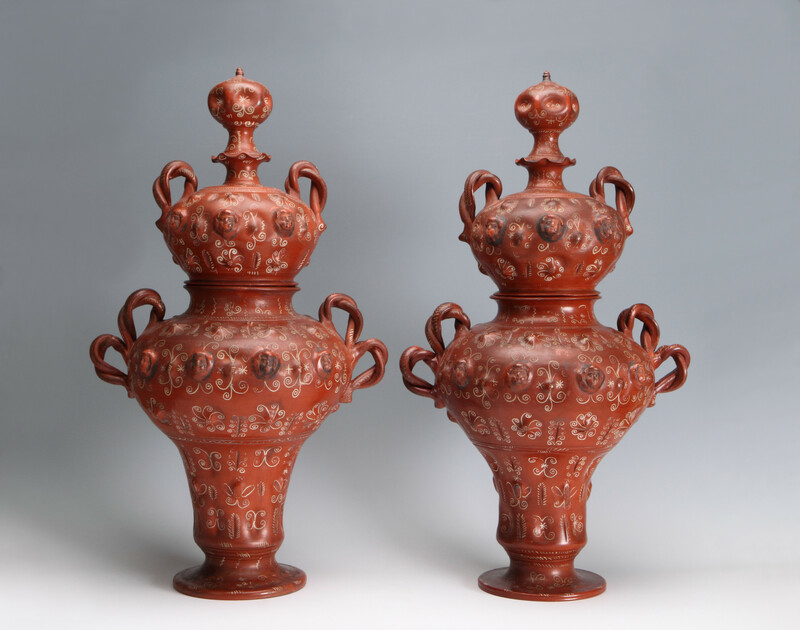 Tonalá vases have been preserved in many of the most illustrious collections of Europe such as those of the Medici in Florence, Hapsburg Kunstkammer in Vienna and the Saxon Royal collection.